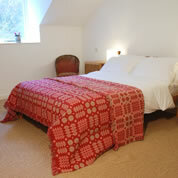 Mountain View offers spacious self-catering accommodation and sleeps 4 -6 people. Holiday cottage guests are welcome to explore Graig Wen's 45 acres of beautiful Snowdonia (as mentioned in the Observer) or soak up the morning sunshine (yes, really) in our garden area. With the spectacular (and family friendly) Mawddach cycle trail at the bottom of the track, you'll probably want to bring your bike. For mountain bikers visiting nearby Coed-y-Brenin, we can provide safe storage.